Bix Beiderbecke: Jazz Age Genius, a biography targeted to middle school students, covers all the stages of the musician’s short but remarkable life, from his early days through his rise to fame, his struggles with alcohol and his tragic death at the young age of 28. Because the original book went out of print, the Midwest Writing Center has been cooperating with East Hall Press, Dr. Karin Youngberg and her students at Augustana College, the Collins Family and the Bix Society and received a grant from Scott County Regional Authority for printing and marketing to make republishing this biography of a local legend a reality. Beiderbecke, born in Davenport in 1903, showed great musical potential even as a child. He grew up during the early days of jazz and quickly discovered the cornet and his calling as one of the great jazzmen of the 1920s. The new edition of the book will feature original illustrations by William Hannan and was designed by Dr. Karin Youngberg and her students through Augustana East Hall Press. It was printed by Fidlar Doubleday Printing. This fresh-off-the-press republished edition now features illustrations by William Hannan! 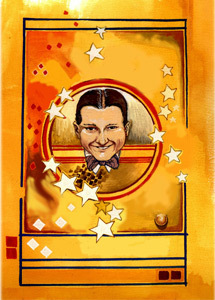 For more information about Bix Beiderbecke, visit http://www.bixsociety.org/!